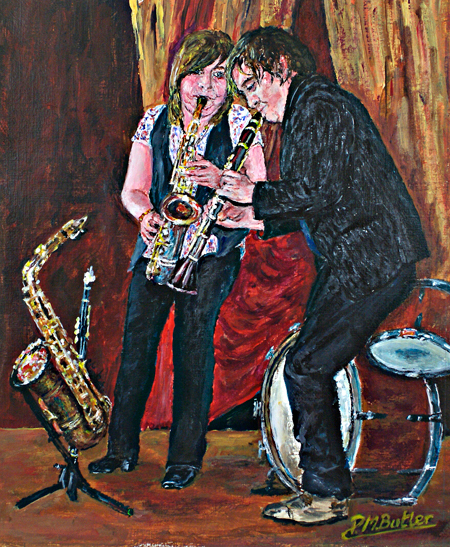 Jazz portrait of Amy Roberts and Adrian Cox keeping the spirit of jazz alive and steeling the show with a stunning duet at the 2010 Autumn Jazz Parade in Hemsby, Norfolk. Jazz may no longer be at the peak of it’s popularity, yet it will forever be for the young at heart. It’s way overdue for a revival and who better to lead the way than rising stars like Amy and Adrian. Tony O’Sullivan introduced them as “the exiting new generation of jazz reed musicians”. Still in her twenties, Amy hails from Cornwall and has rapidly made her mark on the UK jazz circuit and abroad for her stunning performances on saxophone, clarinet and flute. She regularly guest stars with top bands at clubs and jazz festivals and until recently toured widely with the Big Chris Barber Band. Early in 2015 The Amy Roberts Richard Exall Quintet received the ‘Harry Cameron Trophy’ for ‘Band of The Year 2013/2014’. A few years longer on the circuit yet barely in his 30s, Adrian wows the fans with his infectious dynamism on saxophone and clarinet. Already 18 years on road and starring with top bands like TJ Johnson, The Fallen Heroes, The Rich Bennet Band and Max Collie’s Rhythm Aces, his maestro performances are popular across the UK and on the Continent. Influenced by greats like Jonny Hodges, Lester Young and Earl Bostic, he is “sure to have you dancing from the first note”. Based in London and the Home Counties, Adrian is a familiar face at top venues with The Adrian Cox Quartet. Amy and Adrian are the future of jazz. Read more about them under Rising Jazz Stars. 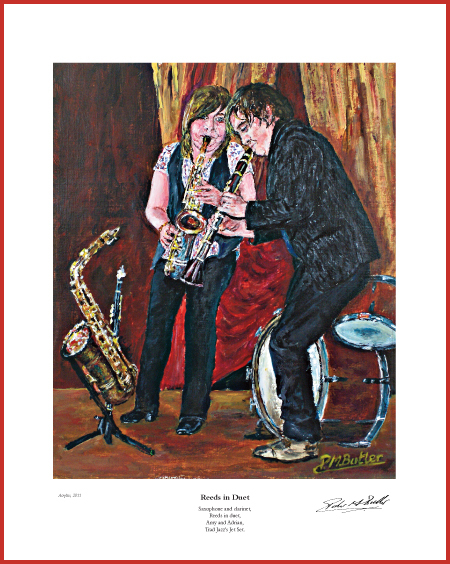 I write a poem to accompany each fine art print of my jazz portraits and for Amy and Adrian it just had to be “Reeds in Duet”.